Now you can connect it all together. If you are not new to electronics, maybe you have bradboard. But I haven`t so I soldered it :) Here you have scheme how it should be connected. If you are not familiar with resistor coloring rules, upper one is 10kOhm, lower is 1kOhm. For those like me, who doesn`t have breadboard, here is the same connection as above. Again, if you are not familiar with resistor coloring rules, upper one is 10kOhm, lower is 1kOhm. If you try to read value on GPIO 17, you should get value "1". While you are pressing a button, value should be "0". Next step is to use some programming skills to read state change of the button. The main problem is that GPIO itself can not directly tell you something is happening with the button. So only possible way is to do something called polling: asking GPIO on value on GPIO17 every few milliseconds. But short presses can be skipped what is unacceptable. At the beggining I found some C and C++ programs using polling. I have some knowledge of C and C++ from school. But later I found Python source code with imported module that can directly detect falling edge of voltage on GPIO pin (button press). Here is source code in Python which will execute a command "echo Button press detected!" on button press. Now every button press will write echo on screen. Only possible way to stop this program is by pressing CTRL+C (KeyboardInterrupt). And you can also notice that one button press is sometimes evaluated as multiple. It`s because event called bouncing - multiple falling edges of voltage on single press. Only possible way how to avoid this behavior is to set delay after button press. 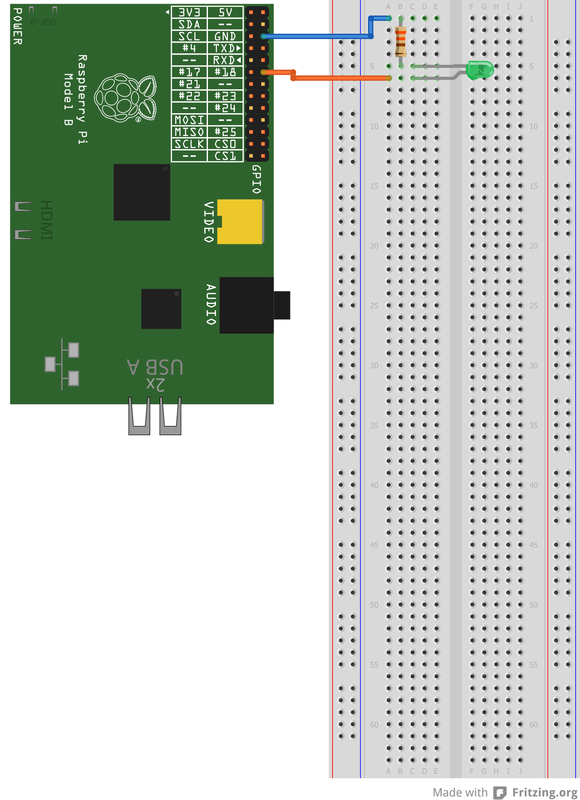 Now with properly connected LED and GPIO port properties you can try to change GPIO port value to "1" and LED should light up. 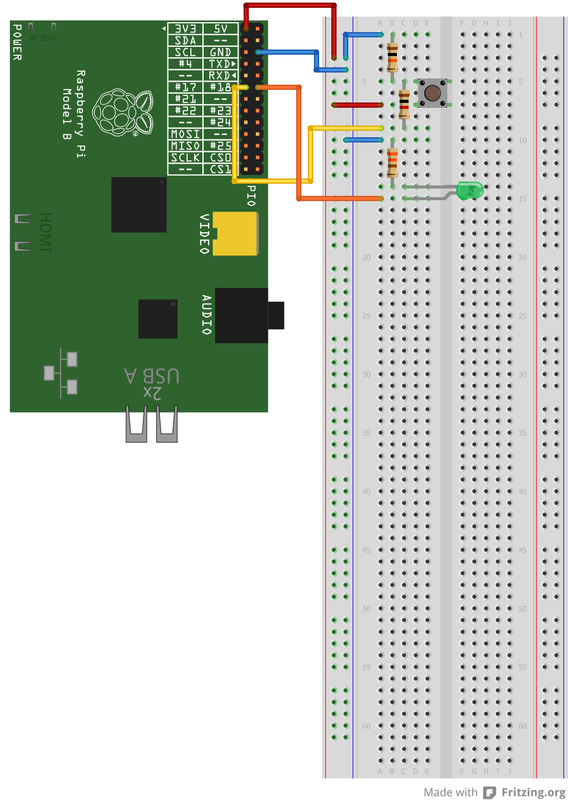 To automate changing GPIO port values you can use Python programming language. Here is a simple piece of code which change state of GPIO port to value "1". Next is program which at the beggining will read the state of GPIO (from "value" file) and inverse that state. Look at the command in bold. It is very interesting. In previous functions you read value to variable "value" from "/sys/class/gpio/gpio18/value" file. The problem is that this value is read as string, not number, so no logical (bool) operations can be used. Function in bold will ensure transition of string to integer (number). Till now you can work with variable in calculations. And now the interesting part. We can use button to control LED. Here is a schme I currently use. This is a simple Python program to use button to control LED. Every button press will change the state of LED. But here you can see drawback of using half second delay to suppress bouncing effect. Quick pressing of button (under 0,5 second) can be ignored due to delay.